The down payment gift rules are as follows: Firstly, the gift must be documented with a formal gift letter. Secondly, a paper trail must be shown for the gifted monies as they move from the gifters’ account to the home buyer’s account. Finally, the gift may not be a loan in disguise. 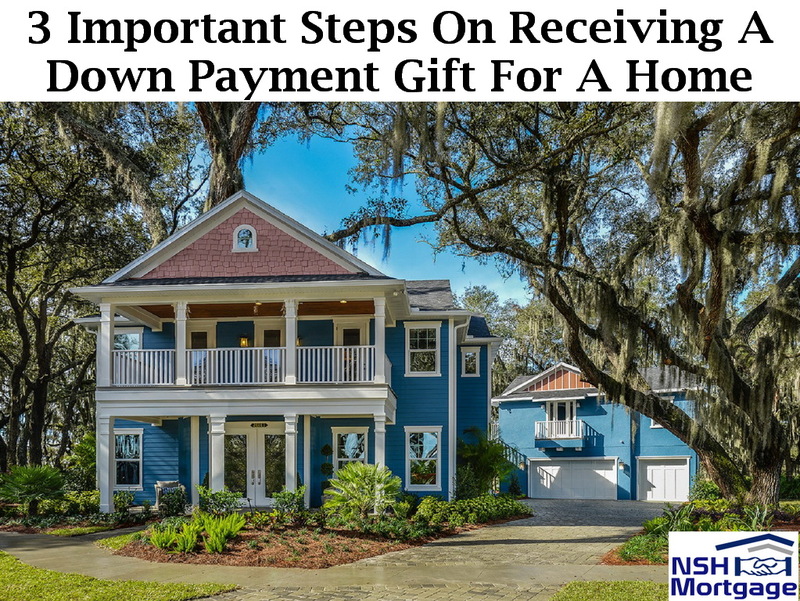 Three important steps on receiving a down payment gift for a home purchase. NSH Mortgage has the knowledge and tools to work out how to give and receive a gift. Home buyers are permitted to accept up to 6% of a home’s purchase price in the form of a cash down payment gift. Receiving a cash down payment gift for the purchase of a home? Which many home-buyers do and these down payment gifts can make it much easier to purchase a home. Mortgage lenders allow cash gifts for down payment on an extensive structure of loan programs including FHA loans, VA loans, USDA loans, conventional loans, and jumbo loans, too. However, if you are getting a cash gift for down payment, you will want to be sure that you receive your cash gift properly. Should you acquire your gift improperly, your lender will most likely reject your home loan application. It is imperative, therefore, that you follow all the rules of cash gifting for a home loan. It is common for today’s U.S. buyers to receive cash down payment gifts. First-time home buyers are most likely to obtain a cash gift among all buyer types, but repeat and move up buyers receive them, too. The largest driver for today’s gifts of equity is the want of U.S. buyers to make a 20% down payment. With a 20% down payment, home buyers can often qualify for the lowest mortgage rates offered by their bank. With 20% down, there is no accompanying private mortgage insurance (PMI). Furthermore, with 20% down, buyers can seek loans backed by Fannie Mae and Freddie Mac which, over 30 years, may be cheaper than using a FHA loan. Mortgage loan limits cap at $424,100 nationwide except within designated high cost areas where home prices exceed the national average by some multiple. High cost areas were established by the government and it affects a lot of major cities and their surrounding counties on the western side of the U.S. including Washington DC. In high cost areas, conventional loans are capped at $636,150 for single family homes, and multi-unit homes which can range up to $1,223,475. Not everyone receiving a cash gift wants to make a 20% down payment, though. Some prefer to make small down payments instead. Low down payment loans also allow cash gifts for down payment. For example, the FHA mortgage, which requires a 3.5% down payment allows cash gifts. Additionally, so does the Conventional 97 mortgage and the HomeReady™ mortgage from Fannie Mae, both of which require just 3% down. When you accept a down payment gift, remember that there is a right way and a wrong way to do it. For example, you cannot randomly deposit your cash gift into a bank account. Doing so will get your loan denied. The relationship of the gifter to the giftee. A note that the gift is actually a gift and not a loan and will not be repaid. The gift letter should only be needed and should not contain extra information. In addition, it needs to have all parties sign and date the letter. With your mortgage down payment gift letter written. You will want to make sure you do not violate the rules of taking a gift. Notably, in order to do this make sure to keep an extra strong paper trail for the money being gifted. If you are the person who is gifting funds to the buyer, for example, and you sell your personal stock holding as part of the down payment gift process, you will want to make sure that you document the sale of your stock as well as the transfer of funds from your brokerage account into the account from which you are making the gift. Do not make the transfer without a proper paper trail. Next, you will want to write a check to the home-buyer for the exact dollar amount specified in the gift letter you have written. Photocopy the check, then keep one copy for your records and give one copy to the buyer. The lender will want to see it as part of the process. Note that writing a check will require more steps and require more effort than simply wiring funds to the buyer. Be okay with these extra steps. It is simpler for a lender to document and track a personal check than it is to track a wire; and it is good to make things simple for the bank. Now that the gifter has handed, in the form of a check, a down payment gift to the buyer, the following steps are required. First, with the gift check in hand, the buyer should physically walk into a preferred depository bank (for example; Wells Fargo, Bank of America, Chase, Huntington) to make the deposit in person. Do not deposit the check online using an iPhone or Android app; or at a ATM machine. In addition, into whichever bank account you deposit your gift money. Just make sure it is the same bank account from which all your money at closing will be drawn. You do not want to bring money to closing from multiple savings accounts. This, too, can complicate your paperwork for the lender when your goal is to keep things simple. Deposit the gift funds into a bank account. Under no circumstances, you should never co-mingle your gift deposit with other monies, nor with other gifts. The amount distinguished on your teller receipt should match precisely the dollar amount on the certified down payment gift letter. If the amount is off by even a penny, the lender will likely reject your letter and the funds that came with it.